First Sabbath after the Ninth of Ab; so called because the hafṭarah begins with the words: "Naḥamu, naḥamu 'ammi" = "Comfort ye, comfort ye my people" (Isa, xl. 1). The custom of reading certain lessons from the Prophets independently of the sidrot on the three Sabbaths before and the seven immediately following this fast-day is apparently a very old one. The Pesiḳta generally assigned to Rab Kahana (ed. Buber) enumerates these ten hafṭarot in the same order in which they are now read everywhere; namely, Dibre (Jer. i), Shim'u. (ib. ii. ), Ekah (Isa. i. 21). Modern custom assigns to the third Sabbath the first part of the chapter, beginning with the word "Ḥazon"; hence the name of that Sabbath among the Ashkenazim is "Shabbat Ḥazon." Maimonides ("Yad," Tefillah, xiii. 19) assigns the first twenty verses of Isa. i. to the second Sabbath, and the remainder of the chapter to the third. 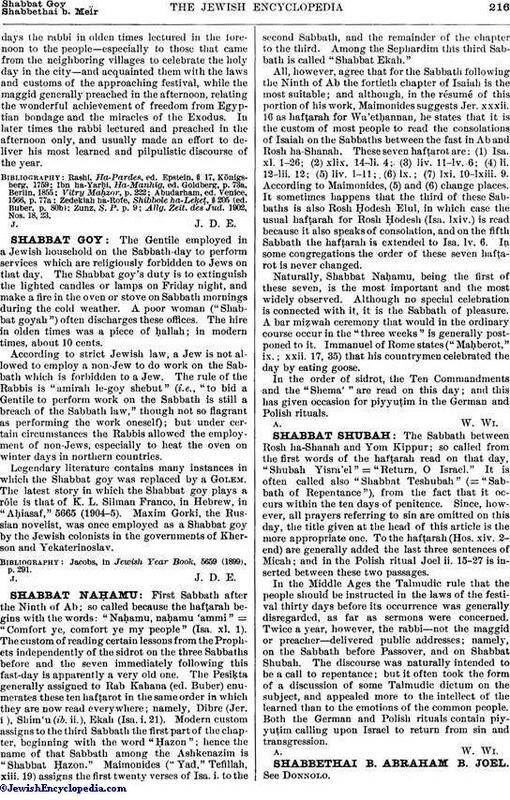 Among the Sephardim this third Sabbath is called "Shabbat Ekah." All, however, agree that for the Sabbath following the Ninth of Ab the fortieth chapter of Isaiah is the most suitable; and although, in the résumé of this portion of his work, Maimonides suggests Jer. xxxii. 16 as hafṭarah for Wa'etḥannan, he states that it is the custom of most people to read the consolations of Isaiah on the Sabbaths between the fast in Ab and Rosh ha-Shanah. These seven hafṭarot are: (1) Isa. xl. 1-26; (2) xlix. 14-li. 4; (3) liv. 11-lv. 6; (4) li. 12-lii. 12; (5) liv. 1-11; (6) lx. (7) lxi. 10-lxiii. 9. According to Maimonides, (5) and (6) change places. It sometimes happens that the third of these Sabbaths is also Rosh Hodesh Elul in which case the usual hafṭarah for Rosh Ḥodesh (Isa. lxiv.) is read because it also speaks of consolation and on the fifth Sabbath the hafṭarah is extended to Isa. lv. 6. In some congregations the order of these seven hafṭarot is never changed. Naturally, Shabbat Naḥamu, being the first of these seven, is the most important and the most widely observed. Although no special celebration is connected with it, it is the Sabbath of pleasure. A bar miẓwah ceremony that would in the ordinary course occur in the "three weeks" is generally postponed to it. Immanuel of Rome states ("Maḥberot," ix. ; xxii. 17, 35) that his countrymen celebrated the day by eating goose. In the order of sidrot, the Ten Commandments and the "Shema'" are read on this day; and this has given occasion for piyyuṭim in the German and Polish rituals.